Given the heat wave that some of us are experiencing now that summer is upon us, outdoor cooking is looking much more appealing than it usually does. It’s only logical: to avoid heating up your kitchen by cooking indoors, you just stand in front of a 500 degree grill outside where it’s already hot. Plus, I don’t really want to turn on my oven and heat up the kitchen, so when a craving for pizza picked up, I turned to the grill to make some instead of the oven. This is a great all purpose pizza dough that is very easy to work with. It isn’t wet, but it is very flexible. This makes it very easy to handle and easy to roll out. I find that it is actually much easier to roll out the dough for a pizza when you begin making the dough yourself because it takes time to develop a feel for the dough. If you don’t want holes, stick with rolling – instead of practicing your pizza-tossing skills – for a while. 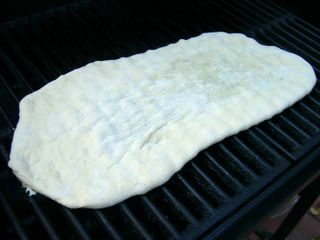 After preparing the dough, I heated up my BBQ – it’s a gas grill – to high heat. I laid the dough down and after a couple of minutes on each side, it was done! 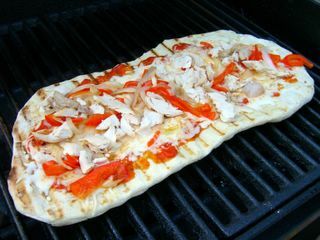 Toppings have to be put on after the first side is grilled. Since they only get a brief cooking, it’s best that you cook them in advance. Keep the amount of cheese on the low side, otherwise it won’t melt. I topped one with corn, tomatoes, red peppers, onions, black beans and clilantro (above) and the other with sauce, mozzarella, chicken and sauteed onions and peppers (below). Proscuitto or some pre-cooked sausage would be great in the topping mix, as well. 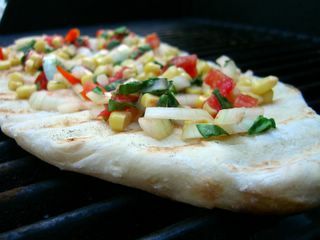 The dough turned out to be very crisp and tender, with a slight chew to it and a good grilled flavor to it! Carefully flip the dough over and place your toppings on the cooked side. If you’re using cheese, turn the heat down a bit and shut the lid of your barbeque. Continue cooking for 3-4 minutes, until the dough is browned and crispy. Previous PostPrevious SHF #10 Reminder: Honey, am I forgetting something? Oh they look good! Do you think it would work as well on a charcoal bbq? This is something I’ve been wanting to try for some time. But, apparently, I like pizza a lot more than Matt…so it still hasn’t happened! Clare – It would probably be better on a charcoal BBQ, with some smokiness added. The only obstacle would be making sure you have a nice, even temperature. Stephanie – I think this is a very un-pizza pizza, since it turns out so light. And you can top it with anything (or just dip it in olive oil). Really lovely pizza. It turned out just right. Are you from L.A.? I figure not as it’s only 80 degrees in Los Angeles. We do get heat waves but it means over 100 degrees for days on end. I am indeed, Anonymous. And I can assure you that there were several places in the area topping triple digits this week! I do this a little different — with a Boboli pizza crust. Then I slice roasted red peppers & zucchini, fresh mozzarella, fresh basil and base it with a Herbed Balsamic Vinaigrette sauce (find recipe on http://www.gourmetbetty.com/Recipes/herbed-balsamic-vinaigrette.html). Donâ€™t forget a bit of salt and pepper to taste. Itâ€™s the hit of every party! Just last week I had a pizza grilling party with about 15 friends, where I prepped the dough and toppings, and everyone got to make their own pizza. It was just perfect and I strongly recommend having friends over to make this pizza. (It’s especially fun watching your friends who “don’t cook”, cook!). I added some fresh herbs to the dough (thyme, chives, parsley) and used some garlic infused olive oil and it was INCREDIBLE! On your gas grill (with lid closed) – preheat all burners to high with your pizza stone(s) set right on the grill racks. When hot – slide your flattened dough onto the stones, brush edges with olive oil, toss some sauce, toppings & cheese on – close lid and bake for about 5 minutes. Turns out great! Tastes better than oven baked and cooks so much faster. Note: Keep toppings to a minimum. Don’t worry about making a round pizza, just roll out to a size that you can easily handle. try this with some diced tomatoes, fresh basil, olive oil, couple cloves of miced garlice, salt and pepper. Will this be available in Wilmington NC soon? I’d love to grab a hot slice after installing a Contain A Pet dog fence or training a dog in Brunswick County or installing a pet containment fence in New Hanover County NC. FoodieView Blog » Recipe Roundup: Homemade Pizza! Pizza on the Grill | That's Cooking!